How do I Register for Washington County Gives? 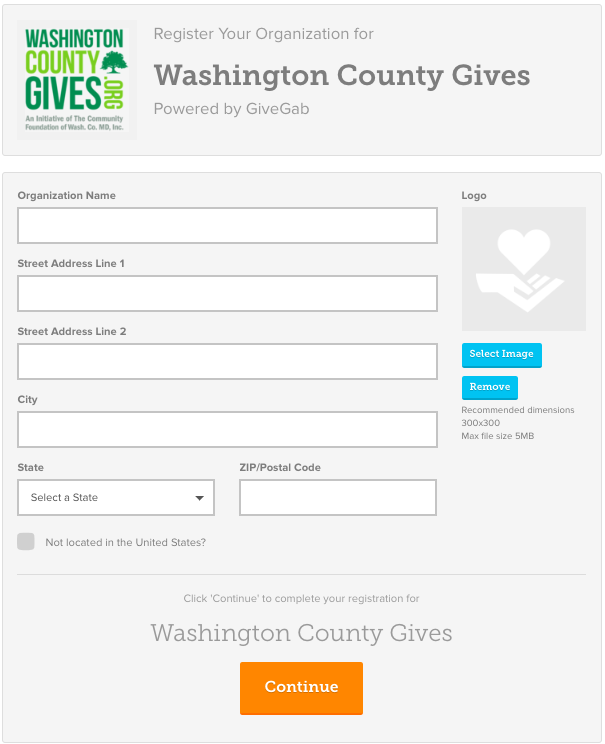 Learn how to register for Washington County Gives 2019! From www.WashingtonCountyGives.org click the "Register" button on the main landing page to begin the registration process. If your organization has fundraised on GiveGab, click the "Participate" button next to your organization's name. 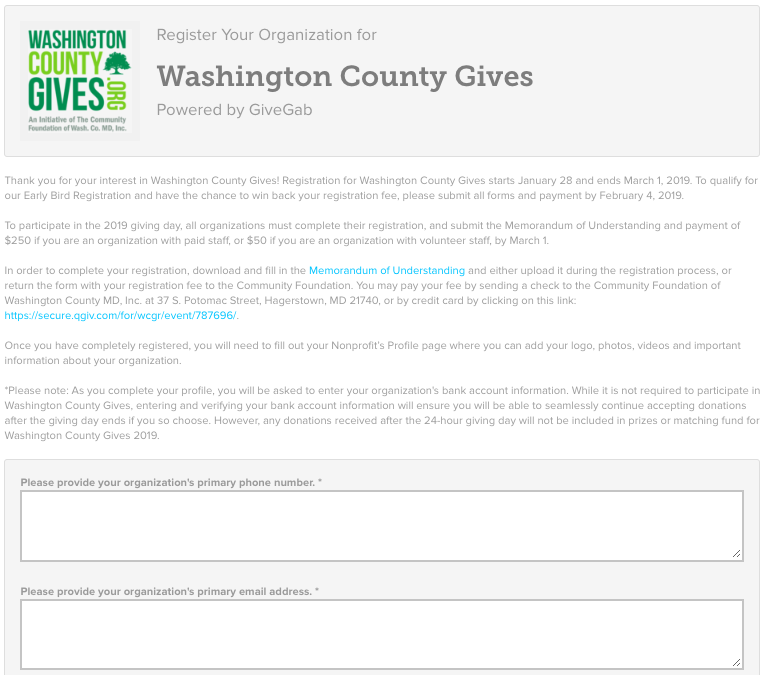 After clicking "Participate" you'll be directed to login to your GiveGab account to finish the registration process for Washington County Gives. If your organization does not appear in the search results, don't fret! Just click the "Add My Organization" button to continue with the registration process. If you clicked the the "Add My Organization" button you'll be directed to this registration form where you'll be prompted to enter some basic information about your organization. This is also where you'll create your personal login to access and edit your organization's Washington County Gives profile. You can add additional administrators to your organization's account once you've registered. Once this section is complete click the "Continue" button. After completing the steps above you'll be directed to the final page before your registration for Washington County Gives is complete. 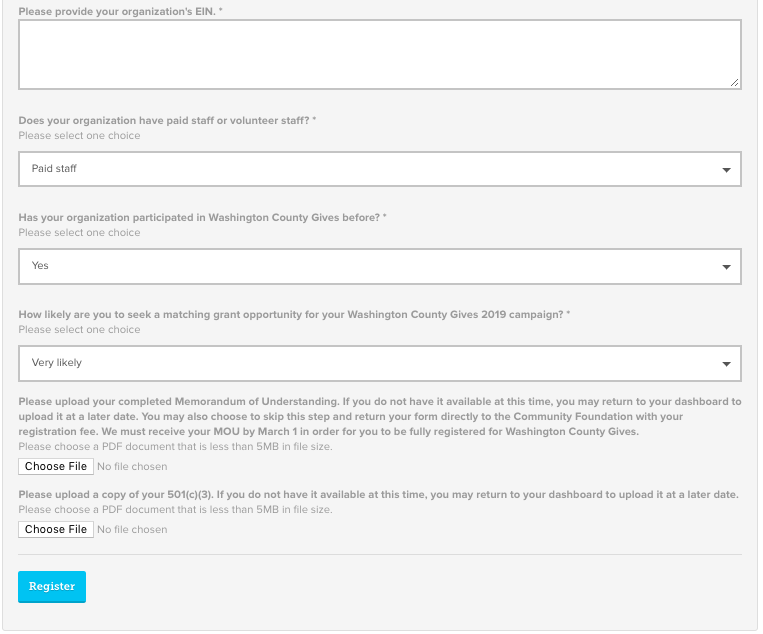 Here you'll need to answer the required survey questions, upload your 501(c)(3), and download and complete the Memorandum of Understanding before finalizing your organization's registration for Washington County Gives. You may either upload your completed Memorandum of Understanding online, or return it to the Community Foundation with your registration fee. Once the survey is complete click the "Register" button to complete the registration process. You'll receive an email confirmation and automatically be redirected to your Washington County Gives dashboard on GiveGab where you can begin customizing your Washington County Gives profile. You may pay your registration fee by sending a check to the Community Foundation at 37 S. Potomac Street, Hagerstown, MD 21740, or by credit card: https://secure.qgiv.com/for/wcgr/event/797701/.